Northern Lights, a majestic and colourful natural aurora can be seen on occasion in the North Donegal night sky. This Collection features rich navy, burgundy, red, sea blue and starry white, offset against contemporary charcoal, inky indigo and boot black bases, woven in Donegal. There are geometric designs, reflecting the grainy night sky over a horizon of lichened granite landscapes. Key pieces include minimalistic tailored fit blazers in geometric weave wools, tailored fit washed chinos, geometric print cotton shirts and clean, sophisticated knitwear. The fabric is a mid-weight pure new wool navy, crossed with a subtle chocolate single windowpane check. Styled with a blue and grey micro design shirt and blue knitted tie. 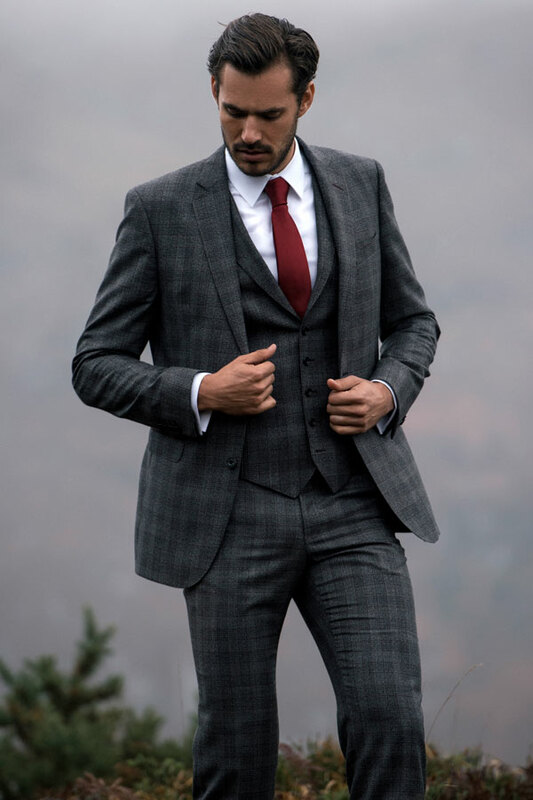 The fabric is a textured wool with a black and white glen check design crossed with burgundy. Styled with a tailored fit white cotton shirt and burgundy silk twill tie. The fabric is a contemporary blue-brown geometric wool blend. Styled with a white tailored fit shirt, burgundy tie and burgundy slim fit chinos. The fabric is a blue-grey Glen stripe with subtle flecks of colour throughout, designed and woven in our mill in Donegal. 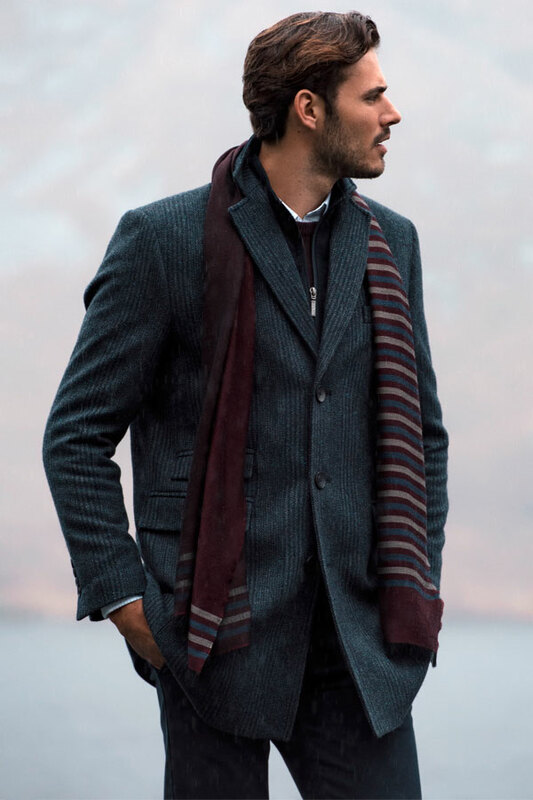 Styled with a burgundy lambswool crew neck jumper, white shirt and striped scarf. A timeless grey melange lambswool cable crew-neck sweater styled with a micro design shirt and burgundy needle cord slim fit chinos. The fabric is a subtle navy-blue houndstooth wool-cashmere blend. 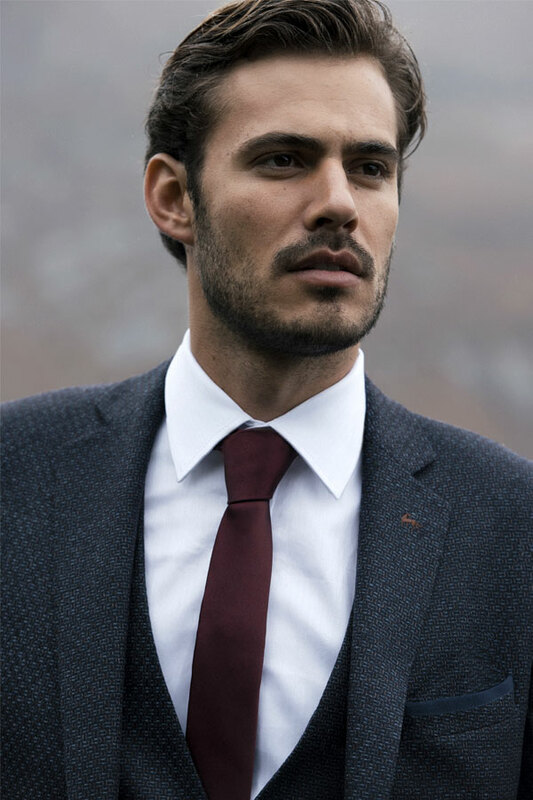 Styled with a Finn tailored suit, blue and grey micro design shirt and knit tie.